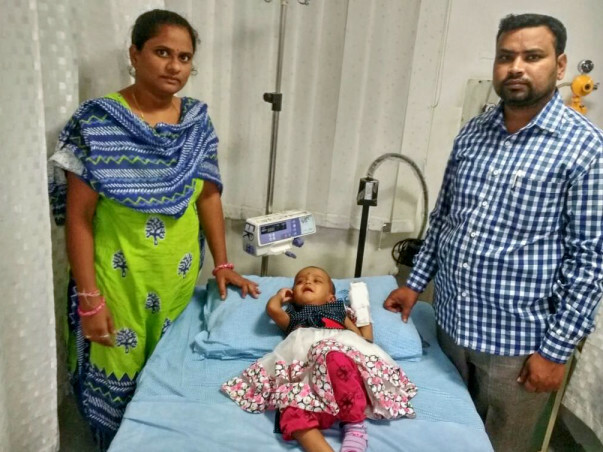 Since Srihitha, daughter of Praveen, was just two months old, she has been fighting a severe liver condition called Biliary Atresia. Biliary Atresia is a childhood disease of the liver in which one or more bile ducts are abnormally narrow, blocked, or absent. The only treatment for her condition is a liver transplant. The total cost of the transplant is around 16 lakh Rs. This amount is far too high for Praveen to afford and he needs our help. Your contribution can give Srihitha the treatment she deserves. Thank you for your generosity and kindness towards Srihitha. Her health has improved now and she is looking brighter and is playing, like a child her age should be. She is currently on medication and will have to undergo tests to check her progress two months from now. We are hopeful that she will continue to recover in the same pace. We would not have got this far without your support and our family is grateful for all the love. Thank you for the wonderful support that you have shown towards Srihitha. She is doing better now compared to earlier. She is on medication at present and the doctors have advised us to visit the hospital on 28th June. They will be conducting a few tests based on which they will be suggesting the future course of action. At present, her mother is a match and she will be donating a part of her liver to our daughter. Here is a quick update on Srihitha. Srihitha has been discharged on 8th December and she is currently at home. She is on medication for fever and jaundice. During the last check up the previous week, the doctors said that she can continue with the antibiotics and injections until the liver transplant. 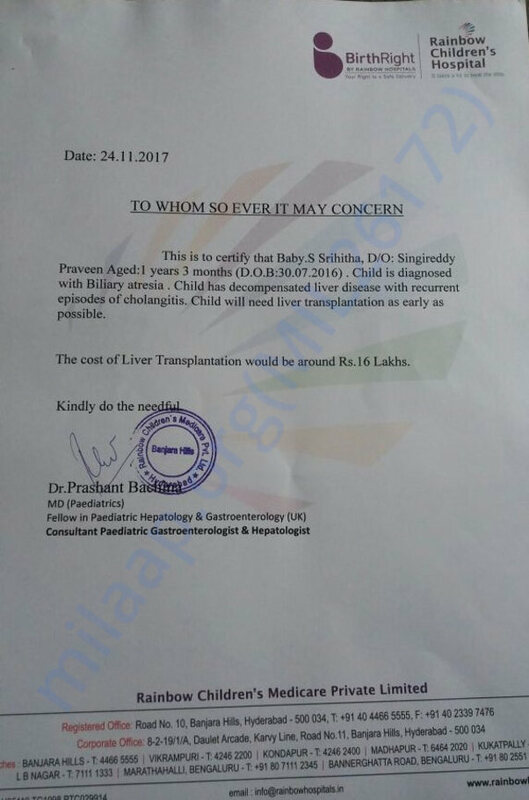 The liver transplant will be conducted soon on arranging the required funds. Thank you for your support and love for Srihitha. Please keep her in your prayers.